In the overseas territories, at the beginning of the 20th Century, western surgery is put into practice by the physicians of the Colonial Health Service in two different and successive manoeuvres : first the emptying and isolation of the village dispensary out in the bush, then the promotion of technical modernisation in hospital complexes. The pathology to be taken into account has two facets : a cosmopolitan pathology which is ubiquitous and a specific pathology which will be termed exotic or tropical. The choices depend on the particular working conditions and tropical environment, often making the adaptation of the usual operating techniques or the invention of new ones obligatory. Tropical surgeons become particularly famous in many fields : traumatology, gynaecology-obstetrics, bacterial infections, parasitic infections, more recently leprosy surgery and, in countries where a physician is frequently called in late, a great variety of reparatory operations. The surgeons possess, in the eyes of the natives, the fascinating aura of "miracle workers". The great majority of students in medical schools for the indigenous populations aspire to follow in their footsteps rather than to become hygienists, generalists, biologists or psychiatrists. At the beginning of colonial expansion, the Colonial Health Service physicians accompany the invading troops. Later they are in charge of an isolated dispensary, the classical "poste de brousse". There, faced with every kind of situation requiring urgent surgery that cannot be circumvented because of the impossibility of evacuating the patient to a centre that is specialised and equipped, they take care of every patient with the means available. They are helped in this task by the knowledge they have acquired in the faculties they have graduated from, completed by the very pragmatic teaching of the Pharo. In traumatology, it's a matter of reduction and immobilisation of sprains, dislocations and fractures, the location and suture of wounds and, exceptionally, amputation. Later on, the traumatology due to road accidents takes on a particular character which is linked to over-increase of generally badly-maintained vehicles, resulting in the arrival at the dispensaries of a host of wounded patients in various stages of affliction, which necessitates a lot of sangfroid in the choice of the order in which they are to be treated. In the treatment of infections, it's the incision and drainage of the abscess, myositis but also pleurisy as well as peritonitis and collected gastro-urinary infections, particularly the dreadful phlegmons of the perineum. These are transformed into "watering-can roses" exuding nauseating pus through every orifice. Strangulated hernias must be operated on : their big size fortunately often prevents intestinal necrosis, but the intestine thus affected must often be taken out rather than attempt a suture which is doomed to failure. Appendicitis and perforated gastric ulcers are uncommon in the bush. Finally the obstetrical and instrumental manoeuvres concerned with cases of difficult childbirth must be executed and, when necessary, even caesarean operations performed. Similarly, uterine curettage and the treatment of ruptures in the case of extra-uterine pregnancies fall to their lot. In the case of serious haemorrhage of the peritoneum, while there is no blood bank to compensate for anaemia, Bourrel * proposes in 1959 a procedure he has had recourse to: the auto-transfusion of blood flowing in the abdomen. The physician himself performs the anaesthesia, very often rachidian (spinal) anaesthesia, or he supervises, even as he operates, the general anaesthesia usually induced by the inhalation of chloroform or ether. Moreover, he practises or supervises the elementary biological examinations and the sterilisation of material by means of petrol autoclaves or Poupinel sterilizers. An omni-practitioner in every sense of the word, he performs surgery beyond the capacity of generalists in the rural areas of France at that time. These operations are performed in a an unpretentious room in the dispensary called the operating theatre, lighted by sunlight or petrol lamps. The assistants are native collaborators; the instruments are sometimes rudimentary. The inventive genius of the handyman is going to blossom out, helped by the illustrations in the lessons on operating techniques of the Pharo, describing the many uses of local products. From time to time, the tactician must wipe the brow or drive away a fly. The isolated doctor is fated not to be recognized for his anonymous accomplishments, but what a lot of agonizing situations he has to go through while shouldering his unparalleled responsibilities ! Little by little, in the capitals, colonial hospitals are built which must necessarily be equipped with authentic surgical services where qualified surgeons, who have obtained their diplomas during their brief stays in France, practise. They generally prepare for their qualifications at the Pharo and it's there that they obtain their diplomas. Until 1945, in each colony of black Africa, there is only one hospital and only one qualified surgeon. Indochina and Madagascar are better provided. The means of evacuation are inadequate so that, in districts where medicine is practised, isolated doctors continue to perform urgent operations on the spot. After the Second World War, the situation improves in two ways. First, the means of evacuation become easily available and second, in the less important towns, hospitals spring up and the surgeon-generalist of the past receives the support of specialists in other services - ENT specialists, ophthalmologists, gynaecologists, obstetricians, orthopaedists, etc. Fairly rudimentary in the beginning, specific technical equipment is increasingly better adapted, and eventually becomes almost as good as that in complexes in France. These surgeons are able to have recourse to specialists in anaesthesia and reanimation, to blood banks, analysis laboratories and x-ray services, which permit them to practise in conditions very similar to those of their time. Individuals begin to be known, teams are formed, the trends of certain schools of thought manifest themselves: the operations performed are many and structured, backed by the faculty and, most of the time, coordinated by the Pharo School. A plan of action of exceptional efficiency and scientific progress is thus put in place. But overwork and the lack of secretarial assistance and iconographic facilities casts a shadow on this enterprise. - What is predominant is a cosmopolitan pathology (digestive, urinary, gynaecological, obstetrical, etc...) which is original only in its context: a pathology developed to deal with the absence of early diagnosis, the limits of the possibility or the delays in evacuation, deficiencies in the therapy originally intended and, finally, modifications brought about by climatic, economic, social and hygienic conditions, combined parasitic or infectious diseases. The patient is often debilitated, infected with malaria, anaemic, badly nourished and has not been vaccinated, especially as a child. - Then there is what is termed exotic or tropical pathology specific to the continent, the territory or the zone concerned with. At the beginning, there is a lot of uncertainty about the agents responsible, their transmission, the diagnosis and the treatment. Besides, there are few reference books and documents on pathology, especially in an isolated dispensary. This explains the very realistic attitude of prudence that is recommended by the Pharo when it comes to ill-considered technical transpositions and the adoption of simple life-saving gestures before an evacuation or the administration of a secondary treatment that has been postponed. It has often been necessary to discover or adapt established techniques. Some examples are surgical interventions in lymphatic filariasis, leprosy, bilharziosis, etc. - The process of ossification in the African is more intense, as Piganiol* and Hervé* show in 1955, followed by Bèzes* in 1958. This can have the beneficial effect of a rapid healing of fractures. On the other hand, it can be troublesome in the case of frequent lesions, ignored and not attended to, where inappropriate bone-settings will be consolidated and aggravate the after-effects of traumatism. - Every open lesion is bound to lead to over-infection and all its complications. Besides, healing itself raises the problem of the unpredictable and very stubborn keloids (raised scars) dreaded by all, patients as well as surgeons (Pales* 1942). Scarifications, just like ritual mutilations, are subject to the same risks. - Quinine injections badly administered can generate abscesses and sciatic paralysis as Grall* and Marchoux* noted back in 1926, followed by Assali* in 1943. Corrective surgery is often indispensable in the case of different traumatic after-effects but also for neglected congenital malformations or the after-effects of poliomyelitis suffered 10 or 15 years earlier. In Madagascar, the Antirabé Centre specializes in functional re-education. The techniques used are not uncommon but the patients are. - In obstetrics, the very young age of the primiparas (women who bear a child for the first time), then the great multiparity (it was generally admitted that, for 4 or 5 pregnancies, the mortality rate allowed only one baby to attain adulthood) leads to many difficult deliveries in the village with death in utero or ruptures of the uterus with dreadful prognosis. Tetanus in the new-born has long been an agonizing problem. - Vesicovaginal fistulas, brought about by difficult deliveries on narrow bedpans or a bad "presentation" of the new-born, constitute, by their frequency and their human and social repercussions, a real plague. Following Baroux*, in 1967, the usual techniques are brought up to date. - Ritual sexual mutilations also bring along their share of complications. - In Gynaecology, infections are frequent, without efficacious treatment, before the arrival of sulfanilamide in 1930. 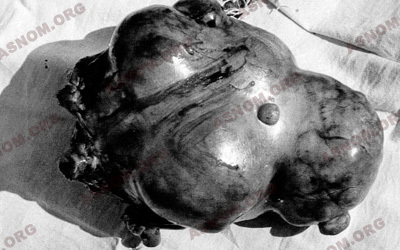 Marcotorchino*, in the 1950s, operates on what he calls, "The African Gynaecological Complex" : a real pelvic mass consisting of a uterus often fibro-infectious and pyosalpinx in women who are still young. - Cancers are generally observed at a stage far too late or doctors are not consulted. Very early, the disease myositis purulenta tropica provokes many works, those of Leroy des Barres* in 1929, of Huard in 1932 and of Huard* and Montagne in 1938. On osteomyelitis, the synopsis achieved by Carayon* and Lestrade* dates from 1959 and it is established that dreponocyte facilitates perioperative osteitis and visceral infarction. 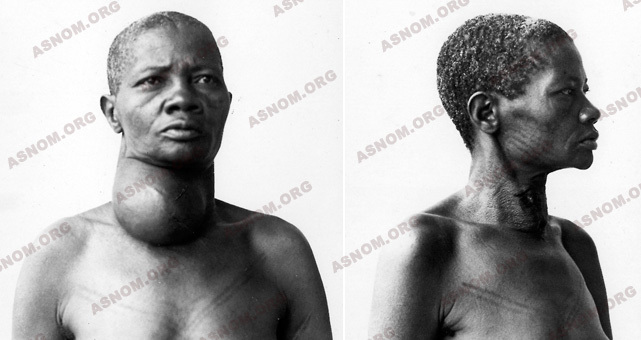 In 1938, Botreau-Roussel* assembles in his work "Cliniques chirurgicales des pays chauds" the quintessence of his original observations of osteitis in the disease known as yaws (pian) with the particularly interesting formations on the face: the goundou. In spite of the efforts of Assali* in 1938 and Marchotorchino in 1953, phagedenic ulcers continue to represent in the tropics a terrible danger whose pathogenic and therapeutic aspects remain subjects of discussion for a long time. In 1958, O'Connor* defines the ways in which these lesions become cancerous. The noma (canker) has justified the surgical feats for the reconstitution of the cheek in order to permit normal alimentation. Leprosy surgery has received special attention from the Health Service Surgeons. The surgical complications of amoebiasis, especially amoebic abscesses, even colic necrosis, studied by Huard*, loom large in the practise of colonial surgeons. The surgical aspects of bilharziosis are complex, as C. Chippaux* insists in his publications on urinary complications, Dejou* and Navaranne* in their work on abdominal locations in surgery, Hervé* and Piganiol* on genital complications. G. Morin devotes his thesis in 1954 to the study of ureterohydronephrosis. Pellegrino* and Nosny* come up with authoritative syntheses. 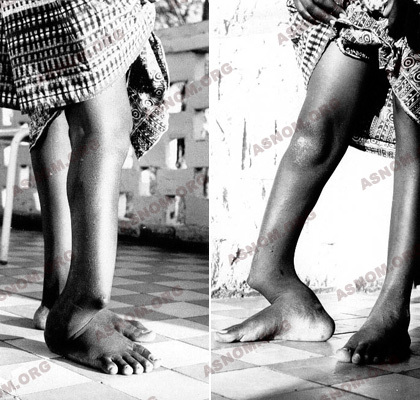 Elephantiasis, an aspect often monstrous of lymphatic filariasis at the level of the scrotum (Botreau-Roussel*, Guyomarch* 1910, Ouzilleau* 1912 and Sanner*) or in the lower limbs (Delom*1936, Botreau-Roussel* 1937, Dejou* 1952) are the objects of descriptions and original therapeutic approaches. Another filariasis, the Guinea worm or dracunculosis, is still treated in the traditional manner. Mycetoma, the invasion of the bone by a fungus causing Madura foot, is the object of classification by Bouffard* in 1919 and of anatomical pathology studies by Camain* and Secrétain*, while Dejou* and Bèzes, in 1967, finally put in place the therapeutic practices and surgical techniques. The medical treatment of leprosy and its reactionary complications are what is essential in the fight against this disease. However, it doesn't always avoid the occurrence of neuritis, some aspects of which evolve inexorably towards trophic (nutrition-related) and paralytic complications. Besides, in countries where endemic diseases are rife, one encounters numerous cases of debility as an after-effect in lepers who are, according to the O.M.S., "healed on the level of bacteriology". Leprous bacilli are mostly to be found in the nervous vessels on the surface of the body: the inflammatory reaction enhances the volume of the nerve while its envelop thickens, becomes inextensible and an "internal mechanical compression" of nerve fibres takes place. - the ulnar nerve on the elbow (arm-elbow duct): tension in triquetral bones of the fingers and anaesthesia of the fifth finger. - median nerve of the wrist (carpal duct): loss of reaction in the thumb and anaesthesia of the two or three first fingers. - external sciatic-popliteal nerve of the knee (on the neck of the fibula) : equine varus in the foot. - posterior tibial nerve in the instep (tarsal duct) : tension in the toes and trophic troubles in the soles of the feet. - facial nerve (fallopian canal and the fibrous partition of the parotid cavity) : inability to close the eyes, ulcerations of the cornea and blindness. 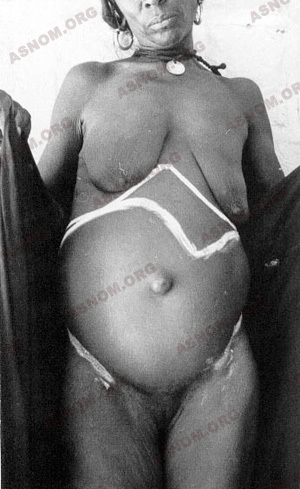 - the loss of sensitivity more or less extensive at the extremities, the most serious complication of leprosy as it facilitates burns and other traumatisms with secondary infections, necrosis, ulcerations and "spontaneous" amputations. - The paralysis of certain muscles in the hands, the feet and the eyelids. From time immemorial, surgeons have been requested to drain suppurations or regularize extremities that are infected or subject to necrosis, to block a joint in a position where it can function. Ever since medical treatments have been able to stop the evolution of leprosy and the secondary infections, this sort of surgery is only concerned with patients who are treated late. Since the fifties, the possibility of dealing with fixed lesions has been the origin of the use of classic surgical techniques of traumatic paralysis with "automatic" results in the hands of surgeons having the experience and respecting the directions. But the leprous hand remains insensitive and only essential movements such as the flexing of moving fingers and the reaction of the thumb have to be restored. Brand and Riordon were the instigators of this surgery for the hand in 1952. In 1953, Carayon* proposed a new technique of tendinous transfer for the treatment of paralysed feet. In French-speaking countries, once again in the fifties, the known techniques (essentially those of S. Bunel and then Zancolli for the hand; those of Lambrinudi and then Carayon for the feet) were used by Lagrange, Viette, Carayon* and Bourrel*. 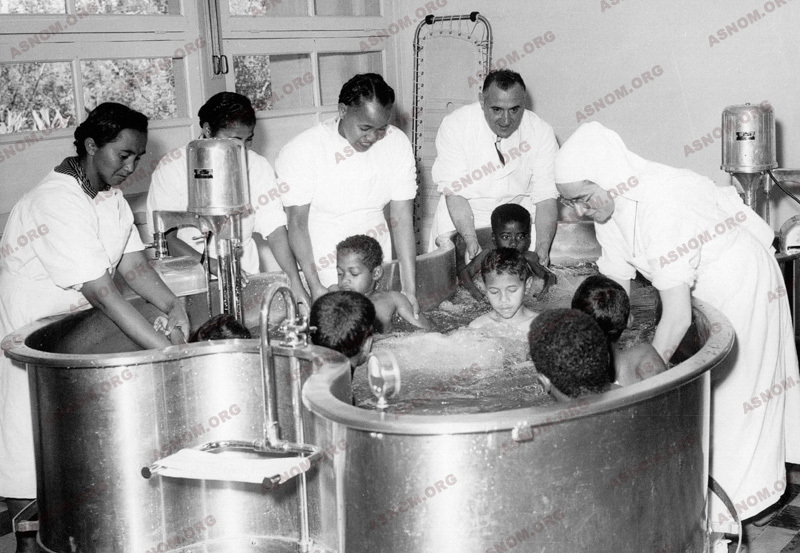 From 1958 onwards, a service of leprosy surgery was put in place at the Marchoux* Institute in Bamako by Languilon* and Burrel*, coming from the neighbouring hospital of Point G. The surgical treatment of large numbers of leprosy patients began there. Later, this service will render certain techniques more dependable while indicating the instructions to be preferred, choosing those which, when the results are the same, are the simplest and demand little or no post-operational functional re-education. In fact, real leprosy surgery is that which, in addition to an efficient medical service, takes into consideration, early enough, leprous neuritis in order to prevent the destruction of nerve fibres and thus guard against debility. After the attempts made by some authors, Guardagnini, in 1955, laid the foundations of this surgery by proposing to associate the external decompression by the opening of osteo-fibrous ducts with the internal decompression of nerve fascicles. From 1957, Carayon* undertook, in Dakar and Marseilles, a clarification of a real fascicular neurolysis and the pursuit, as he wrote in 1987, of "a long and arduous research into the indications and modes of treatment of leprous neuritis". Bourrell*, meanwhile, in Bamako, Dakar and Marseilles, was putting forward a simplified technique of decompression that could be used by a majority of generalist surgeons. In the sixties, The surgeons of the Pharo School would succeed one another at the Marchoux Institute of Bamako and later at the Institute of Leprology in Dakar, created in 1976 by Languillon and there put into practice this surgery, while Cornet* introduced it into Vietnam and J.F. Blanc* into Madagascar. Thus the Pharo Surgical School played a particularly important role in the progress of the surgical treatment of leprosy. - Les Agrégés du Pharo : Techniques élémentaires pour médecins isolés. tome I: Techniques chirurgicales . Editions DGDL - Diffusion Maloine Paris 1981. - Douin : Santé et médecine en Afrique tropicale - Pratiques quotidiennes - Tome II. Editeur Paris 1980. - Annales de chirurgie de la main : Table ronde sur les paralysies des muscles intrinsèques de la main. vol. 5 N°3 1986 p.214-241.